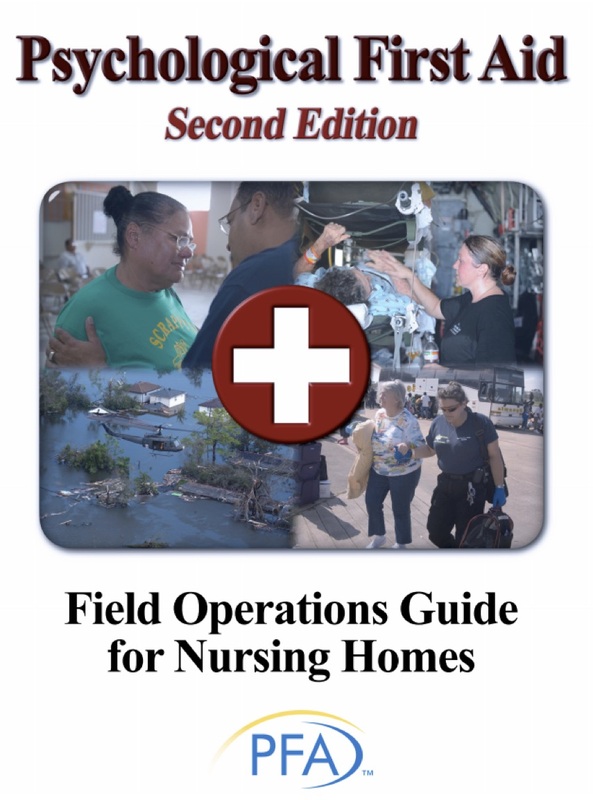 In an effort to address the mental health needs of nursing home residents impacted by these disasters, the first edition of "Psychological First Aid: Field Operations Guide for Nursing Homes"was developed in 2008, with an update (Brown, et al) completed in 2011. Integrating a multidisciplinary approach to the provision of disaster-related mental health services, the expanded second edition addresses specifics regarding "how, when and where" Psychological First Aid (PFA) interventions can most effectively be utilized with long-term care residents impacted by disasters. The original manual, which includes an overview of Psychological First Aid (PFA), its eight core actions and progressive steps for comprehensive care, is now expanded to include a focus on three additional topics, including "palliative care and end-of-life issues, behavioral interventions for people with dementia, and use of Psychological First Aid to help older adults deal with significant life changes, events, or losses." The expanded second edition also includes specific focus on nursing home staff needs and handy resources available for use with all stakeholders. In short, this comprehensive manual, available for download at https://bit.ly/2BQxuuq is an excellent and much-needed resource with multiple potential applications for all members of the long-term care community. In concert with policy and procedure manuals, it will be an invaluable addition to the tools of the most well-prepared, patient-centered nursing homes. Time spent learning and integrating this information is an investment well worth the effort! Brown, L.M., Frahm, K.A., Hyer, K., & Gibson, M. Psychological First Aid: Field Operations Guide for Nursing Homes, 2nd Edition, March, 2011. Comments on "A Review: Psychological First Aid"